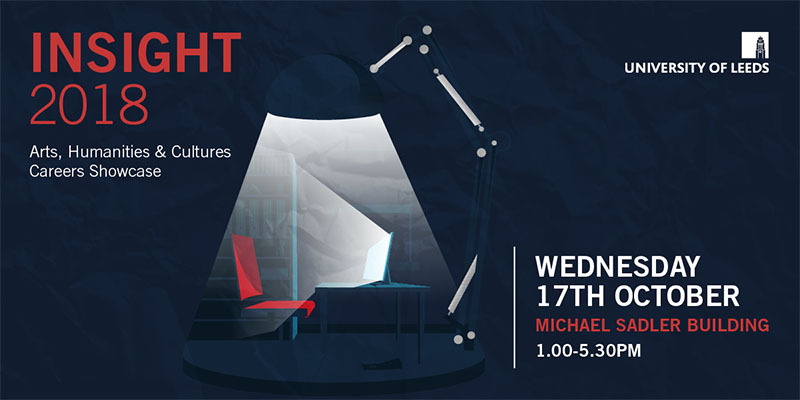 Insight (formerly known as EXPO) isn’t a recruitment event, like a standard careers fair, but a series of different career sector panels, where we bring in alumni and professionals to talk about their experiences and give an insight into their chosen career paths. It’s a relatively relaxed occasion, with no PowerPoint displays, just each of our panellists (usually 4-5 in total) talking about their journey after university, what they “actually” do day to day, and any top tips on how to succeed in their sector. It’s a fantastic opportunity for anyone from the Faculty of Arts, Humanities and Cultures to gain a better understanding of potential future careers. We aim for the event to be as informative, engaging and thought-provoking as possible so try our best to get interesting, innovative and creative panellists on-board for you all to hear from! The afternoon is open to all students from the Faculty of Arts, Humanities and Cultures so no matter what year you’re currently studying in or what school, come along and listen to people who have studied your degree subjects and are working in the sectors you want to work in! **Due to time constraints panels run concurrently throughout the afternoon. If you can’t decide which panel to attend we do have a networking space open all afternoon and we invite all our panellists to come and chat to students after their panel has finished. If you’ve missed a panel that looked interesting come along to the networking space in LG15 where you’ll hopefully be able to talk to a wide range of our speakers. Keep checking above for a full list of our panellists which we will update when new speakers are confirmed.